When I heard the single I'm Throwing My Arms Around Paris the other week, I nearly choked on my dinner. Good lord, Stephen, you're sounding terribly chipper, I thought. 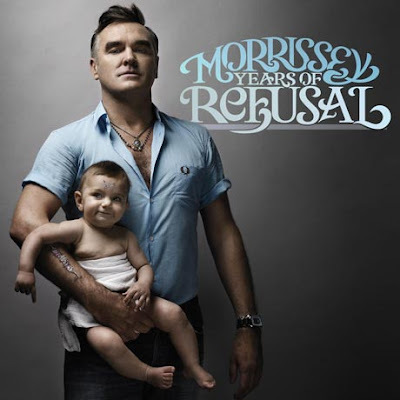 Then again, I've never subscribed to the edict that 'Morrissey equals Misery'. And his ninth solo album is a blisteringly tongue in cheek attempt to draw a line in the sand. Yes, another one. The songs collected here seem to be something of a final statement to his nagging critics. Basically, he spends much of the album saying, 'End of conversation'. It's also a return to the defiance that laced You Are the Quarry and comes with a big dollop of swaggering rejuvenating power courtesy of the down and dirty production of the late Jerry Finn. Once again he settles scores, hurls the odd missile and then concludes by simply saying he can stand on his own two feet, thank you kindly. It all gets off to a grand start with the punky Something Is Squeezing My Skull with its squally guitars and with the Mozz in fine voice as he gets the knife in about modern life. “I know by now you think I should’ve straightened myself out. Thank you. Drop dead.” is the first of many sobriquets to a hostile, media hungry world. It's gutsy and over in a flash. The trotting drum pattern of Mama Lay Softly on the Riverbed follows, coupled with some plinky keyboards and swirly synths. Then it goes a bit mad with creaking guitars and buzzy electronics in the middle eight. It comes to a crescendo with a stirring organ passage, pulsing keyboards and clattering drums. Wonderful. Black Cloud, despite it's squelchy electronics and female vocal opening is perhaps the least effective track. There just isn't enough of a hook to latch onto despite a nice acoustic guitar break, wobbly electronics and the spiky dressing of Jeff Beck's guitar here. I'm Throwing My Arms Around Paris with its cry of "Nobody wants my love/You've made yourself very plain" is a jaunty little ditty with jangling, summery instrumentation. It's typical, uncomplicated Morrissey as he offers up an ironic serenade to that city on the Seine. You'll be familiar with All You Need Is Me, with that killer line “There’s so much destruction all over the world, and all you can do is complain about me,” which featured on the 2008 Greatest Hits album. It's here along with That's How People Grow Up and the more curmudgeonly amongst you may well think you've been shortchanged but they work far more effectively in the context of this album than being shoehorned into a Greatest Hits package. The vented spleen of the former fits right in and the disappointment of non-existent love in the latter is a classic Morrissey theme that runs through Years Of Refusal. The album could be accused of coasting up to this point but this is where it really takes off. The rolling mariachi drums of When Last I Spoke To Carol, are complimented by a gorgeous brass section. It then goes bonkers with an Ennio Morricone bit of brass and whistling, dogs barking and a sheen of synths that'll leave you tingling as much as the electronic wind that concludes the song. It's sassy and yet utterly forlorn as he croons about some poor woman called Carol and blethers on about leaving her in 1975. The pace does not falter on One Day Goodbye Will Be Farewell, all clattering drums, swirly synths and crackling guitars. Perhaps he's trying to let us down gently here but you get the feeling he's already got an exit strategy worked out post 50th birthday. You'll miss me when I'm gone, sort of thing, with the hilarious lyric, "and the smiling children tell you that you smell." Great brass flourishes too as he brings it all to a stuttering conclusion. The album is simply worth buying for It's Not Your Birthday Anymore. An utterly epic shout from the top of the building about the insincerity of the sickeningly sentimental. It's got a lovely clarinet that wouldn't sound out of place in Soft Cell's 'Say Hello, Wave Goodbye'. It climbs and climbs with driving guitars and slowly drifts to a conclusion. Marvellous. The final three tracks obviously have trouble matching this peak. You Were Good In Your Time is another self-examination of his achievements backed by dialogue from a French film that gives it a 1950s flavour but one that also seems to lyrically describe the death of a career. The bizarre thing with this is that its final minute is a sonic experiment right out of the Radiophonic Workshop with the French dialogue and a cacophony of odd noises. Sorry Doesn't Help is a slightly lower key number with a great chorus, urgently propelled by keyboards and guitars. The album concludes with the two fingers up of I'm OK By Myself where he concludes that he doesn't need anyone to dictate his moral stances for him. “This might make you throw up in your bed, I’m OK by myself and I don’t need you, and I never have.” he wails amidst the scratchy, driving guitars and drums going full pelt. He's on good form vocally here too. An excellent stage exit and possibly his best solo album since Vauxhall And I.
I was one of the lucky few to get tickets to the live morrissey gig last Wednesday at Radio 2. He played tracks from the new album and it was fantastic, I have been humming the tunes in my head all weekend, brilliant stuff!